Here's one for the book lovers (i.e., probably everyone reading this). Photographer Franck Bohbot's stunning architecture photos have captured grand movie theaters and glowing city signs, among other subjects. His latest work in progress is "House of Books," a lush tribute to the libraries of the world. The series started in Paris then Roma. 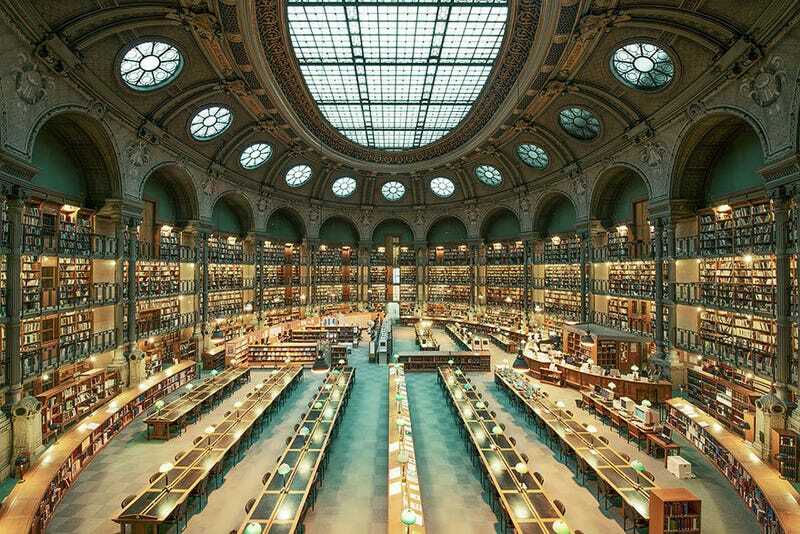 I plan to photograph libraries in Europe, South America, Asia and North America. This is about the places that we have learned and where the books stay for decades ... I wanted to give a new approach, in term of atmosphere, colors and composition. And, I will also included contemporary libraries, small rooms and entrances. This is a long project, and this is the beginning. Architecture blog Curbed has a slew of Bohbot's photos up for your admiration, noting that "Bohbot began his career as a set designer [and favors] a sensuous style of documentation: one is nearly overwhelmed by the grand buildings' rich details, with rare books nestled under arches and historic reading rooms lit like movie sets." Photo by Franck Bohbot via Bored Panda (via Curbed).